To make your trip more easily we will take you to the port of Ibiza by urban bus. 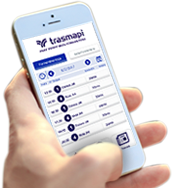 With Trasmapi all are advantages, so that your trip is more comfortable we put at your disposal the regular urban bus line (Line 10), which runs between the airport and the port. of Ibiza (roundtrip). Output frequency 15-20 minutes. Estimated duration of the journey 30-35 minutes. Currently FREE along with your ferry ticket booking at www.trasmapi.com. Remember to add it to your reservation in step n º 2! Only valid for round trip tickets . You can check more information during the reservation process. Do not worry about your transfer to the port of Ibiza! Si ya has viajado en alguna de las dos compañías, Trasmediterránea o Trasmapi, te hacemos un descuento del 20% en la tarifa de pasaje vigente. ¡Simplemente mostrando tu ticket de compra!. Viajando de la Península a Ibiza, consigue un 20% de descuento en tu trayecto hasta Formentera y viceversa. El descuento únicamente se aplicará al comprar tu billete en los puntos de venta propios de Trasmediterránea o Trasmapi. Descuento válido hasta 30 días posteriores a la realización del viaje. Oferta no acumulable y sujeta a disponibilidad. Choose the most comfortable and exclusive service to travel to the port of Ibiza. Do not worry about your transfer, leave it in our hands! Suscriben un acuerdo de colaboración para promocionar el destino Formentera y convertirse en una alternativa más para los habitantes de Formentera que tienen que viajar a la península. Compra tu billete en www.trasmediterranea.com, en el 902 45 46 45, tu agencia de viajes o puntos de venta de Trasmediterránea con tarifas promocionales a partir de 55€ por trayecto. Also the transfer to your accommodation in Formentera! ** To book this service in the "Extra services" section you must select closed times for the round trip, it isn't valid for OPEN travel times. Valid only for round trip tickets. Departure frequency every 20 minutes. Estimated duration of the trip 30-35 minutes. Don’t worry about how to get to the port to spend a journey in Formentera! Maximum waiting time at the airport: 25 minutes. Get the most comfortable and exclusive shuttle to get to Formentera. Don’t worry about your transfer, we handle everything! For greater comfort, when arriving to Ibiza’s airport, Trasmapi offers you a personal pick-up service in the arrivals area to Ibiza’s port on a classy minibus or on a comfortable car. Plus, we also transfer you from Ibiza’s port to the airport on your return. Exclusive service without waiting times. En Trasmapi queremos ponerte fácil tu viaje a Formentera, por eso, al reservar tu billete online de Fast Ferry a Formentera con Trasmapi, te regalamos el traslado en autobús urbano (Línea 10) desde el aeropuerto de Ibiza hasta la Estación Marítima desde donde salen nuestros Ferrys a Formentera. Solo tienes que reservar tu billete online en www.trasmapi.com seleccionando la casilla correspondiente al Bus Urbano en la pantalla de Servicios Extras. Además de ahorrar tiempo y dinero, recibirás un bono de traslado en tu e-mail que deberás imprimir. Este bono es tu ticket gratuito para viajar desde el aeropuerto de Ibiza hasta el Puerto y la vuelta desde el Puerto de Ibiza hasta el aeropuerto. La frecuencia del autobús urbano Linea 10, es de 15 min, llegando a ser cada 10 min en agosto. Y la duración del mismo oscila entre los 15 y 25 minutos. Recuerde que para añadir este servicio a su reserva, deberá marcar la casilla correspondiente al Bus Urbano Gratuito y pulsar el botón SIGUIENTE, en el paso nº 1 del proceso de reserva: ¿Desea añadir servicios extras? PROMOCIÓN VÁLIDA PARA BILLETES DE IDA Y VUELTA CON FECHAS DE VIAJE A PARTIR DE SEPTIEMBRE. Trasmapi Fast Ferry – más barcos, más salidas, más ventajas. Visit Formentera at your leisure! Saves time and money. For your comfort on your arrival in Formentera, Trasmapi offers you the service of renting a motorcycle 49 cc & oacute; 125 cc to enjoy your visit to Formentera. The collection office is Only 100 meters from the landing area in the port of La Savina. The purchase of this service should & nbsp; be done with a minimum of 24 hours before arrival in Ibiza. Service available from May to October. You can check more information during the booking process. Visit Formentera at your own pace by car! Visit Formentera on your own by car! Saves time and money. & nbsp; For your comfort on arrival Formentera, Trasmapi puts at your disposal the rental service of a Fiat Panda (or similar) or Peugeot 207 (or similar) vehicle to enjoy your visit to Formentera. The collection office is only 100 meters from the area of its landing in the port of La Savina. The purchase of this service should & iacute; be done with a minimum of 24 hours before arrival in Ibiza.